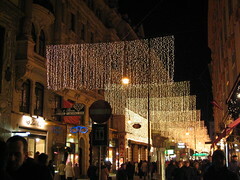 Kohlmarkt, originally known as Coal Market is one of the oldest streets in Vienna. Like Graben, it is an eclectic collection of wonderful historical buildings and up-market shops. On entering Kohlmarkt, your eyes are immediately drawn westward to the green coloured, copper dome of the Michaelertor, which is at the entrance to the imperial palace of the Hofburg. The shop fronts are every bit as enticing as the stunning architecture on the façade and interiors of the buildings. Several famous architects have worked on these buildings including the famous Hans Hollein. One of the oldest structures is a fountain that was originally constructed in 1391 though it has undergone renovations, using the existing plans in the late 19th century. Several famous people throughout history have called this place home including Haydn and Chopin. The street is home to some of the most famous brand names n the world. International designers such as Chanel, Diesel, Armani and Vuitton are represented here. It was once the street inhabited by the Royal court appointed jewelers and this has given rise to numerous jewelry stores such as Tiffanys and Haban. All famous brands such as Cartier, Bulgari , Gucci and Rolex are available. The windows are full of extravagant and opulent merchandise. Lovers of chocolate will think they have died and gone to heaven when they visit Demel, one, if not the best chocolate shop in Vienna. Not only do they excel in chocolate products but also sell the moistest of cakes. Their window displays are also a feature and usually change monthly, each time reflecting on a different theme. Even if you don't buy you will be impressed by the presentation of their products. An art form in itself!! Be the first to write a review about the Kohlmarkt! See below for more information. Have you already visited the Kohlmarkt? If so, let everyone know what you thought about it by writing a review! No registration necessary. Just click here to start writing!